1. PREPARING FOR BLOOD SAMPLE. Open the sealed foil wrapping (shown above at left) and remove the test card (shown above at right.) Prepare the lancet. Then wash your hands thoroughly with soap and warm water. Rinse and dry your hands completely before beginning the test. Select your middle or your ring finger. To increase blood flow, let the arm of the selected finger hang down at your side for at least 30 seconds. If you are right-handed, draw blood from your left hand. (Reverse if left-handed.) Fasting is not required, but in order to compare results between tests it is wise to take the test at the same time each day, like just before breakfast. 2. DRAWING BLOOD SAMPLE. Lay the selected hand, palm up, tight against a flat table surface. Don't let your finger move away during this procedure or you may not get enough blood. Place the lancet TIGHT against the side tip of your finger and press the firing pad. Using the side avoids any calluses that may be present on the finger. You may feel a slight sting. Blood may not appear until you squeeze your finger. 3. ADDING BLOOD TO THE CARD. Carefully place the drop onto the small circular test pad identified on the Chemcard. Wait exactly three (3) minutes for chemical reaction and development. Use a timer. 3. EXPOSING THE RESULT CHART. After 3 minutes, remove the entire tab area from the test card and discard it. 4. READING THE RESULT CHART. 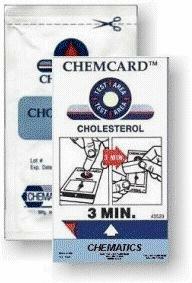 The total cholesterol reading is obtained by direct visual comparison of the test pad with a color chart. The test may include either a sliding chart or a color wheel as shown below. After development time the reactive pad will turn from blood red to progressively darker shades of blue/green. Since this is a qualitative judgment involving color, shade and intensity, it is often helpful to get another person's opinion of test results. It is important to make the color comparison within 30 seconds as the test area will begin to fade after one minute. Each of the six color panels represents a system cholesterol threshold range. The lightest color compares to a level of 150 mg/dl cholesterol. Each successive darker panel compares to system cholesterol levels of 175, 200, 225, 250 and 300+ mg/dl respectively. A reactive pad that appears lighter than the 150 color block should be interpreted as a cholesterol result less than 150 mg/dl cholesterol. Likewise, a reactive pad that appears as dark or darker than the 300+ color block should be interpreted as greater than 300 mg/dl. 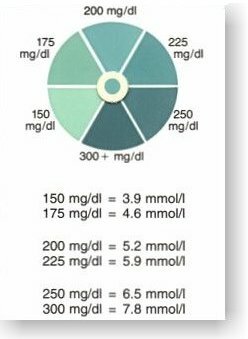 In the example result shown below, the color of the test area indicates a cholesterol level of 200 mg/dl or less. In spite of its simpler design and lower cost, it is no less accurate than the Cholestrak. For additional information about the test accuracy, see Chemcard Accuracy. 5. TECHNICAL INFORMATION. The test incorporates a solid phase chemistry that employs the same principle as the enzymatic wet chemistries which are presently being used in many hospital laboratories. This enzymatic reaction makes use of a highly sensitive chromogen, tetramethylbenzidine, which allows for a visual determination of blood cholesterol. The test incorporates a unique cell separator as an integral part of the device. This separation device allows the use of whole blood as a specimen.